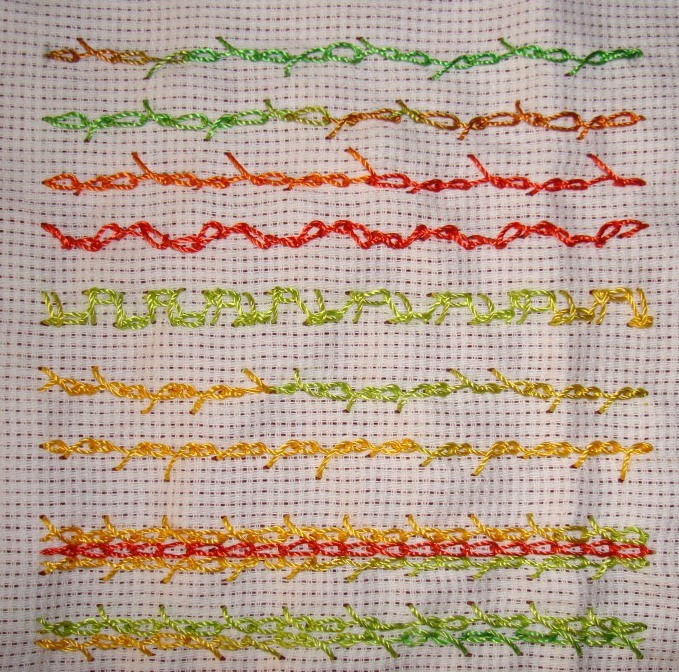 16-I tried this twisted chain and normal chain combination with other stitches. This row the stitch is with buttonhole stitch. 17- a combination with herringbone stitch. 18-first row- the combination of barred chain. Normal chain and alternating twisted chain and normal chain stitches. Second row- barred chain stitch row with double detached chain stitches or berry stitches. 19-first row, barred chain stitch laced with pearl cotton thread. 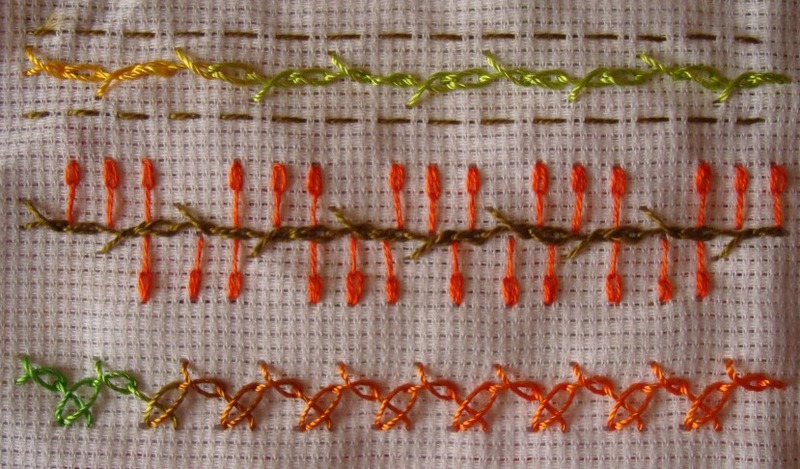 Second row – barred chain stitch with beads. The stitch sampler is completed . 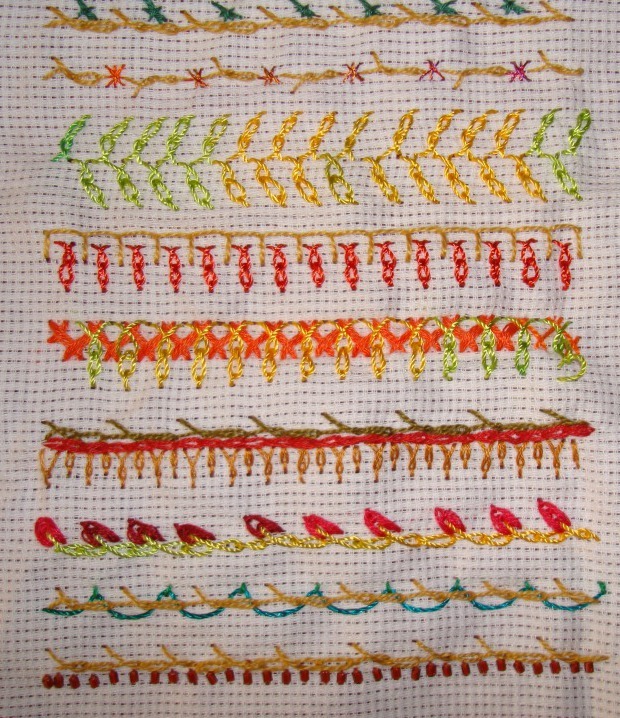 When I started this sampler,Though the stitch was easy to work, I was not satisfied with the asymmetry of the stitch. But from the the fifteenth picture, I started liking this stitch. Totally a wonderful experience. Worked a few more variation of this week’s stitch. 12-a- worked alternated barred chain stitch in between two rows of running stitches. b-three detached chain stitches with long tails worked on the spaces made with this stitch. c-barred chain stitch combined with crossed chain stitch. 13- a row of zigzag stitch worked in between two rows of barred chain stitch. 14- first row , sword stitches are worked on one side. 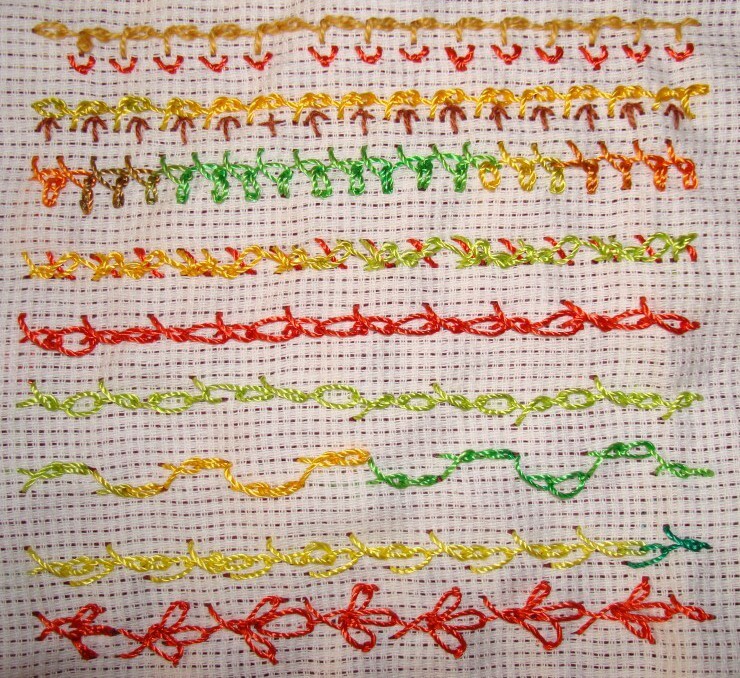 The second row double cross stitch is worked after a set of twisted chain and normal chain stitch. 15- This week’s stitch is about working one twisted chain and normal chain stitch together. I tried this variation, twisted chain and normal chain stitch worked at angles facing away from each other. When I thought about this variation, did not imagine, it will look so lovely. A few more variations of this week’s – barred chain and alternative barred chain stitch. 8-I worked a half cross stitches and did a zigzag version of a.b chain stitch. The next row, the barred chain stitches are worked into the previous chain stitch. 9-the barred chain stitches are worked with cable chain stitch. The second row- a set of barred chain and chain stitch is worked on two levels. The curved row of stitch looks better this way, suppose. 10-The barred chain stitch is worked with shell chain stitch. And A row of barred chain with three chain stitches. 11- a row of barred chain stitch was worked first, then detached chain and fly stitch was worked at the angles made by the barred chain. May try this stitch with other stitches tomorrow. because they are similar. 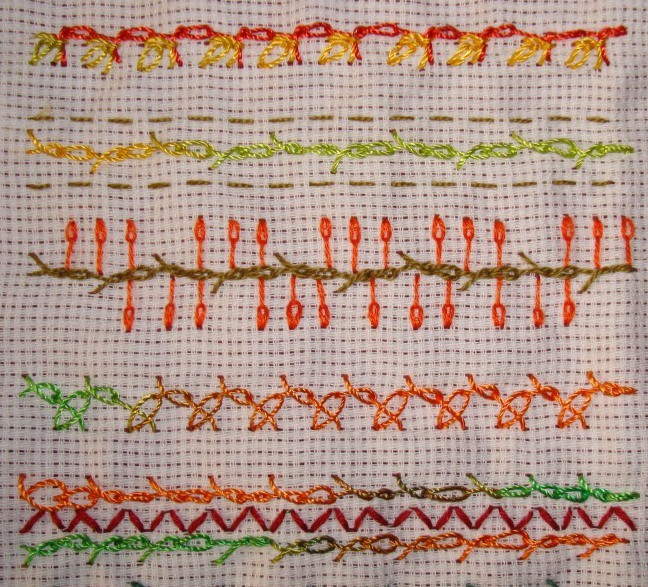 I started with this stitch sampler on the first TAST challenge, when it was rerun on stitchin fingers. .2nd row- the length of the chain stitch is longer than the barred chain stitch. 3rd row-the twisted chain stitches are longer in the top than the ones in the bottom. 4th row- tried a curved version of this stitch. 2-the stitches in the first row turn at right angles to form a pattern. 2nd row- consecutive two stitches are worked on both sides. 3- the barred chain is worked on one side only, the height of the stitches vary in this row. 4-1st row- barred chain stitches are worked on both sides of the normal chain stitch in copper colour. 2nd row- barred chain stitches are worked facing each other. 5-I tried to work the barred chain stitches straight, with fly stitches. 6-worked same as the previous row, with fly stitches placed in between. 7-I worked the chain stitches at right angles to the barred chain stitches.